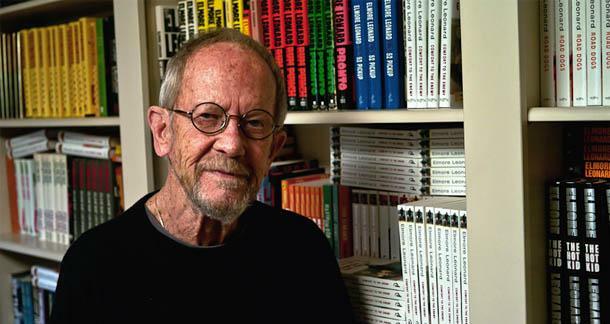 Just had to post something to note the passing of Elmore Leonard – one of the finest crime novelists ever to plonk themselves down in front of a yellow legal pad. Elmore Leonard’s characters have the ability to capture the interest of those who maybe wouldn’t think of themselves of fans of ‘guys with guns’. If you haven’t read his work, you’ve may well have seen it adapted to film or TV. Some of the adaptations were woeful, but a couple were first class. In two – Get Shorty and Out of Sight – the directors of these films understood Leonard’s sensibilities and ‘got’ his clever dialogue. If you haven’t seen them, do it. Not right this second…but soon. Leonard, along with a group of very talented writers who adapted his novella ‘Fire in the Hole’, is also responsible for one of my favourite TV shows of recent years (and it’s fast tracking it’s way to my ‘all time’ list). If you haven’t discovered Justified, then get out from under your rock and catch the hell up. You’re four seasons behind already! But back to Leonard – there are three things I love about his writing. The first is: there is no filler. He wrote with the view of leaving out all the stuff people skim past – so his prose is lean, economical, immaculate. The second thing is the dialogue. I’m a sucker for sharp, clever wit and he has it in spades. But it’s also gentle and human – and sometimes alarming. Just sublime. The last thing, perhaps a little contentiously, is that he makes bad guys fun. Some might call that ‘glamourising crime and violence’ by another name, but I disagree. I think it’s clear the bad guys are bad, as is what they do. It’s simply adding a little fun and humanity into the mix. What’s wrong with that? The last word to the man himself. Gold nugget advice. Here’s Elmore Leonard’s ten rules of writing. ← Ladies, we’re taking over! Nicely put, Billeigh … good to know I’m not the only one smitten! I’ve always classed him as possibly my favorite writer of *real* dialogue. Haven’t seen ‘Justified’ (not big on telly) but will bow to your enthusiastic wisdom and check it out. Will confess that some screen adaptations of his work have left me a bit underwhelmed (maybe my imagination acts out Leonard’s dialogue better than John T. did Chilli Palmer). Certainly a godsend for actors looking for quality material. A friend in late 80s Sydney was put onto Elmore by (Rare Books) Nicholas Pounder, who lent him half a dozen hardcover first-editions and a couple of paperbacks. We met for coffee (Coluzzi Bar), and my mate treated the first-editions with reverential care, but was rather cavalier with the paperbacks – rested his coffee on one of them. Glad to see another admirer of Dutch’s work. Even more glad to hear a caffeine catastrophe was avoided! I will concede there’s a ‘Hollywoodness’ to even the two decent (in my view) film adaptations. I’m yet to see anyone truly nail the full degree of *realness* required. I think you’re right that our imaginations are often far more effective a storyteller than any film. I’ve definitely been vocal about casting decisions in certain films because they don’t look like how I imagine the character to look – sometimes I’m right and sometimes I have to eat my words. But there are usually few films that do their source material justice – unless their source material was rubbish, in which case H’wood can often improve things considerably! But with a writer like Leonard, it’s a hard road to get it right. Immediate example springs to mind: the remake of the old Bronson/Jan Michael Vincent ‘The Mechanic’ – w/ Jason Statham … they just couldn’t help themselves, and *spoiler alert* had to make JS survive the final explosion (via slo-mo of supposed CCTV footage) .. aaargh!!!! No great dialogue or storyline will survive that kind of attitude … I remember reading Rum Punch and being on the edge for most of it … then I saw Jackie Brown and … sighhhhhh … ah well. I’m feeling some pressure about my recommendation of Justified now, but hopeful that it won’t be a complete waste of time on your part. I’d think that the usual suspects – JB etc – would carry the box sets. Me – I’m just biding time waiting for series 5 to air. I understand the first ep will be set between Detroit & Miami – very Leonard. The series is usually focused in on a little pocket of Kentucky. Your post just ate my first comment … logged into my gravatar midstream and … poofffff!!! I can’t imagine it’ll do too much damage. Although with that kind of immersion, you may find yourself talking with a charming Kentucky accent! I can barely keep the twang under control going one ep at a time.